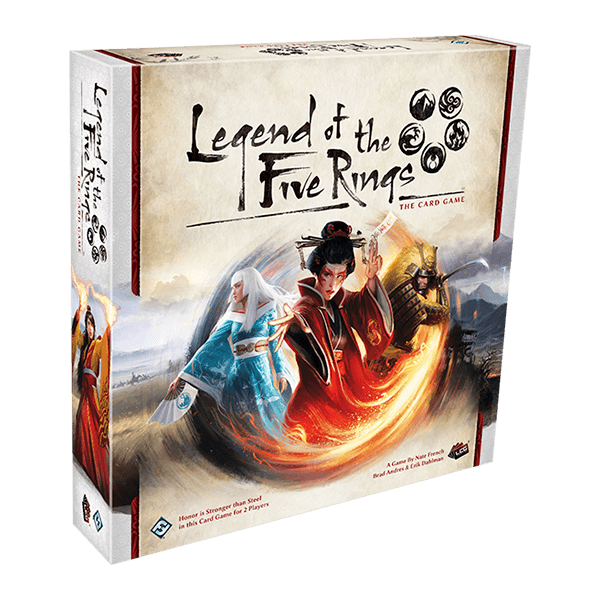 Today I am finishing up the intro to the clans of the Legend of the Five Rings (L5R) Living Card Game (LCG) by Fantasy Flight Games (FFG). 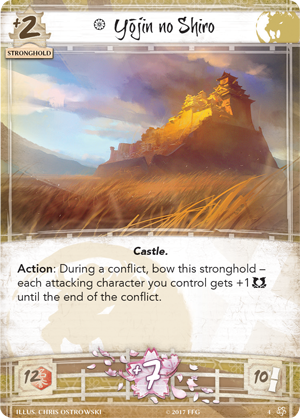 I already covered four of the clans in part one here, so today I will focus on the Phoenix, Scorpion, and Unicorn clans. There are very few cards that haven’t been spoiled yet so we have a very good idea of what a starting deck will look like and perform for each clan now. I’ll continue to use MtG references to help with playstyles of the clans. 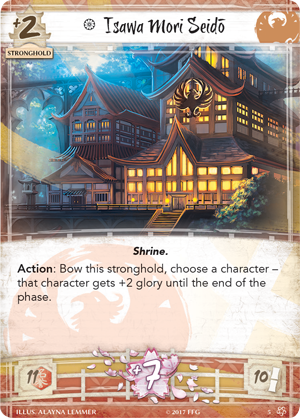 The Phoenix clan is home to the most powerful shugenja in Rokugan. Shugenja are similar to clerics from D&D, they pray to the kami and the resulting blessings are the spells they cast. Most shugenja form a relationship with only one of the kami, but some of the more powerful can commune with multiple. (A lore aside, Kami (with a capital K) are gods, the children of the first sun and the first moon, that fell to Rokugan and helped humanity found the empire. Their legacy lives on as the names of major families of the clans, like Akodo, Bayushi, or Togashi. Kami with a lowercase k are the intelligent spirits of the elements that give their aid to shugenja.) 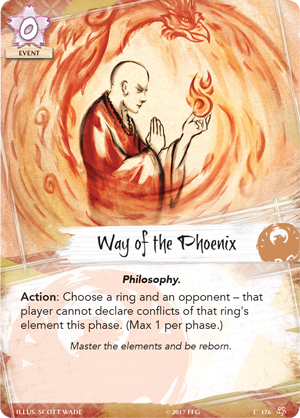 Since the Phoenix clan has such a good grasp on the elements their play focus is on manipulating the rings, like swapping the type of combat to enhance their shugenja’s spells, or preventing a ring f rom being chosen this turn. They have a secondary theme of glory manipulation. Glory is a stat on characters that when honored is added to their military and political strength, or when dishonored is subtracted. The Phoenix’s spell arsenal has some very unique effects that can turn the game upside down. You might like playing Phoenix if you enjoy engine decks like the modern banned Birthing Pod or a commander like Mizzix the Izmagus, since Magic doesn’t have a ring system it is hard to find an analogy that fits. 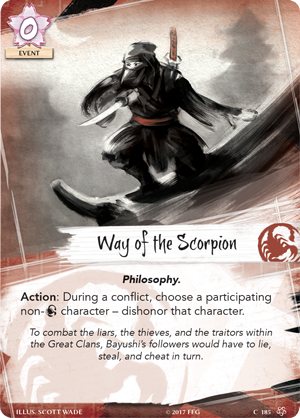 If the Lion clan is the right hand of the emperor, and the Crane clan the left, the Scorpion clan are definitely the “underhand of the emperor,” using ninjas, spies, and manipulations to progress the empire in ways other clans could not. They believe they should get their hands dirty to ensure no one else has to. Most clan’s distrust them, for good reason, but they have the emperor’s best interest at heart. 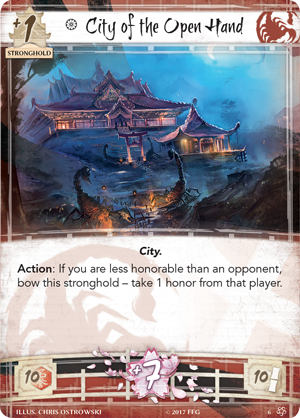 The Scorpion clan is full of tricks, most will result in your opponent losing honor or dishonoring their characters, but are not afraid to lose honor themselves. They also have a few fun mind control effects, as they call in favors, or blackmail your opponents into joining them. You might enjoy playing Scorpion if you like Pauper’s monoblue delver deck, full of tricks and control. The final clan is the Unicorn. 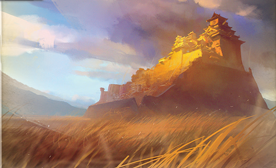 Long ago the Unicorn left the empire to search out threats before they could find Rokugan. After 800 years away, and almost 200 since their return, most of Rokugan still sees them as outsiders and lessers. They still holding to the customs, weapons, and magic they learned outside the empire but are fierce in their protection of it. 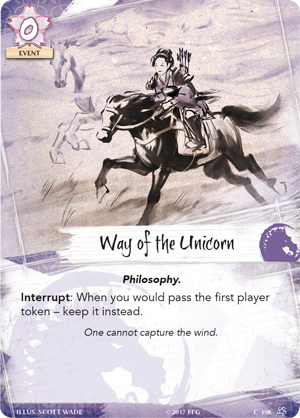 The Unicorn prefer to hit fast and hit hard, using their superior calvary to get in and out before the opponent can put up any resistance. 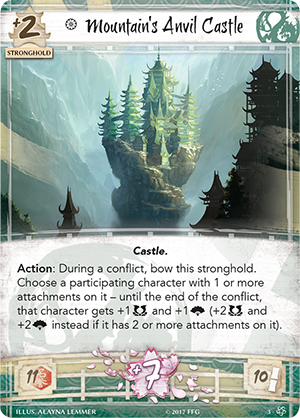 Many of their cards let them move to a conflict. 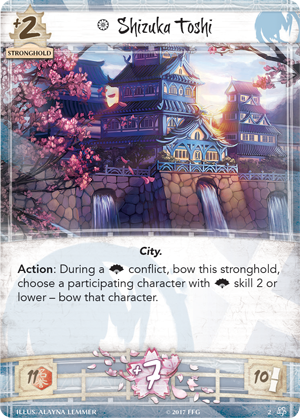 Another of their themes is taking action in the first part of the turn, they get cost reduction, or power boosts if its the first conflict of a turn. They do appear to have quite a dearth when it comes to politcal strength, they can make up for it though with an event that changes the conflict type, which I find hilarious. A good MtG analogy might be RDW (Red Deck Wins, a blisteringly fast linear deck that wants to apply pressure early and keep it on). 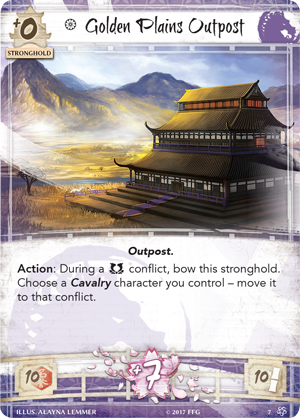 Well thanks for reading this series, I hope it helped you understand a little about the playstyle and themes of the seven clans of Rokugan. If you haven’t already, check out my learn to play article here. I have a few decks printed off and ready to try out if anyone wants to learn to play before it is released. We should be getting a release date this week at GenCon, I’m expecting early October. 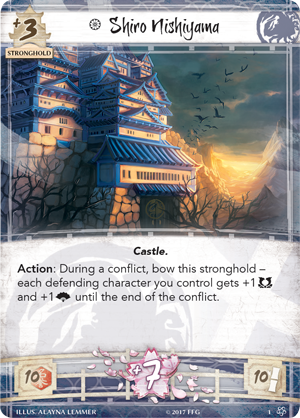 Until then here are all the strongholds I didn’t get into the articles, and I promise I won’t write about L5R again until after release. Thanks!